Posted: 2011.07.01(Fri)20:35 Post subject: Fresh Water Emergency?!?! Daughter thought it was a good idea to share some 2% milk with the fishies! Quickly performed a 50% water change! And that was after my daily 25% change. How much danger is still present. I stopped most of the dump, but about a cap full went into the aquarium. 125mg sodium per cup of milk! 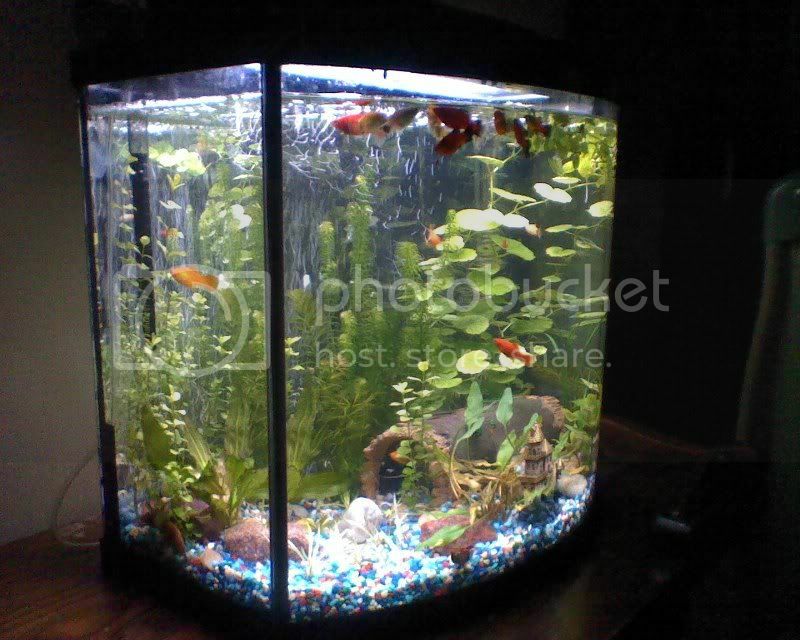 Fish are: Platy, Oto cat, and invertebrates of assassin snail and apple snail. Tank is a 16 gallon. OK, I did some calculation on how many mg of salt may have been added to tank. 16 tablespoons are in a cup. I performed a 50% change immediately and then added a water conditioning tablet for taking out chlorides. If the tablet didn't affect sodium, then what remains in my tank at the moment is 3.9mg of salt in the 16 gallon tank. With this amount, will Oto cat, assassin snail, and apple snail be OK? It's not the salt you should be worrying about. Water conditioner also doesn't remove chlorides - it removes chlorine which is a *very* different chemical species although the name sounds similar. Milk is full of organic molecules, these will decompose into ammonia. I would be keeping an eye out for ammonia or nitrite spikes. The other side effect is because the water suddenly becomes very nutrient rich, you may get a bacterial bloom I.e. water will turn a cloudy color. Just keep up the partial water changes for a few days and everything should be fine. Will do, woke up this morning to clear water and no out of place fish reactions. I was really worried cause of the salt and the snails... but even the pond snails seem fine.., so hopefully the assassin and apple will be too. Unfortunately I ran out of test strips, so will have to rely on smell and Local pet shop for tests. I agree with unissuh, the major concern for you is not salt, but the high amount of protein in the milk. By 2% milk do you mean the cup was already 2%, or it became 2% after the milk was dumped into the tank? Either way, after your water changes, as long as no foul smell or abnormal behavior is observed, it should be fine. Your filter bacteria will take care of the rest. Try to think it this way: If you condense all the dispersed milk protein (after water changes) into a rigid solid, it may be equivalent to a holiday feed block, I guess. You won't be in too much a panic then. Don't forget that it is now actually dispersed and the filter bacteria have enough time and space to deal with it. 2% Reduced Fat Milk. About a tablespoon got dumped in from my guess. Made the tank cloudy, until the 50% water change and daily maintenance. All fish still present and accounted for Even the sensitive Oto cats are good. Snails seem OK too, my apple snail even tried to hang 10 on a piece of floating penny wort last night. Was an express ride for it back to the bottom. My assassin in exhibiting normal hiding behavior. Haven't seem that one again for 3 days. Why on earth are you doing daily 25% water changes? Unless your tank is just packed with fish, there's no reason to do this, and it may in fact be disruptive to the tank's natural chemistry. He is doing daily changes as he put fish in the tank before it was cycled and is trying to prevent ammonia/nitrite poisoning. Well, its been awhile since I last updated. Had several life situations causing me to not post. Here's the score. 0 fish death, no visible damage to any fish. Ditched the Tetra Whisper 2 POS I had for a Fluval C3 which performs 1000% better. It's simply a big suction cup zip tied to aquatic plant basket, lined with filter media and filled with common aquarium gravel. 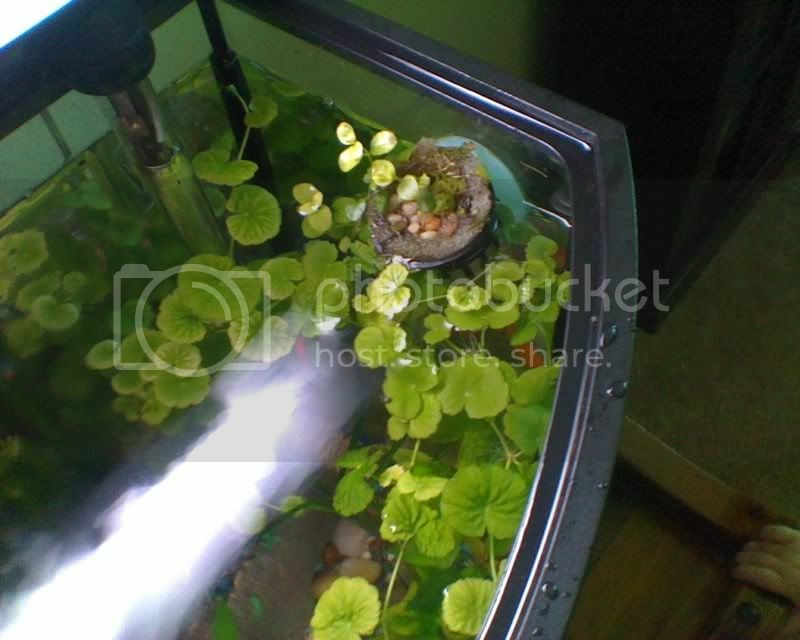 Works great and grows the Pennywort, also provides a space for some platy to hang out under. Thanks for the help on this tank everyone. Couldn't have made it without everyone. The tank looks great, good work!